The Voyager data set is a gift to Earth that keeps on giving. This week, I've seen three great new images processed from this old data set. The first one was made by Ian Regan at my request. 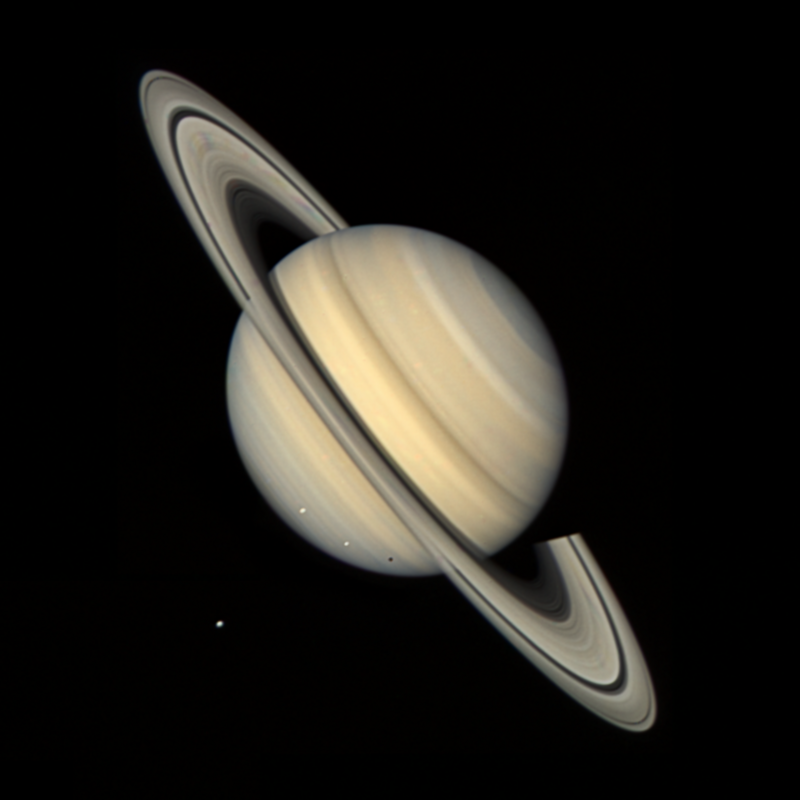 I pointed him to this classic view from Voyager 2, and asked him to make one that was just a bit closer to true color. Here is his result. I love it when moons make cameos in planet portraits. Another awesome new product this week was made by Bjorn Jonsson. He's been working with the Voyager 1 Ganymede flyby data set, trying to process a global view, for some time. He recently had a breakthrough in repairing several crucial frames that were smeared when the Voyager scan platform moved while the photo was being captured, as he explains here. Bjorn posting his Ganymede mosaic inspired Justin Cowart to share some work he's been doing on the other Voyager's Ganymede mosaics. Here's a view centered on Osiris crater. The crater is neat, but my favorite part of the image is below and to the left of it, where the slanting sunset light outlines fascinating topography around a different crater. There's another related mosaic at Justin's Flickr page. 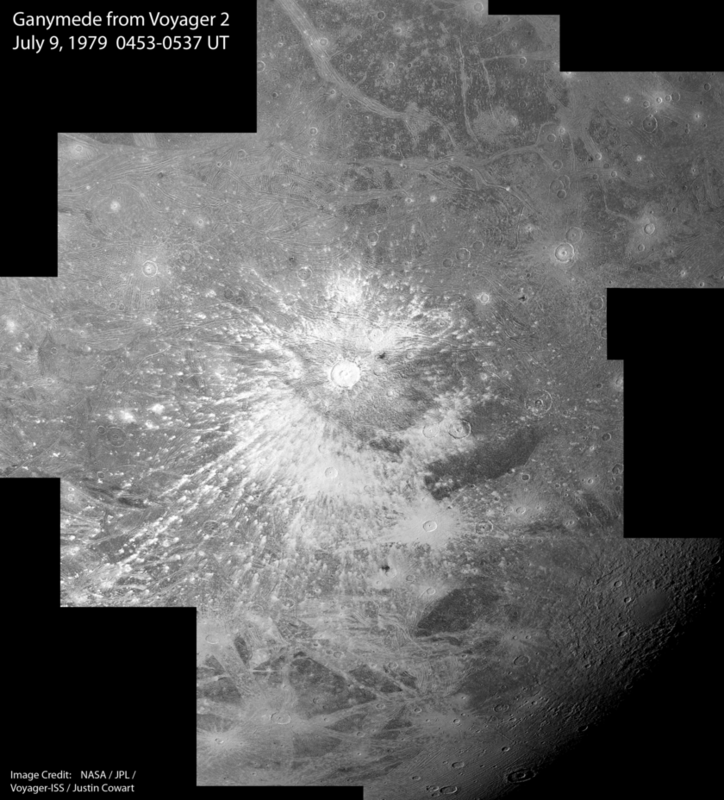 19 frame mosaic of Ganymede taken during Voyager 2's flyby of the moon on July 9, 1979. This image is centered on the bright Osiris Crater and surrounding ejecta deposits. 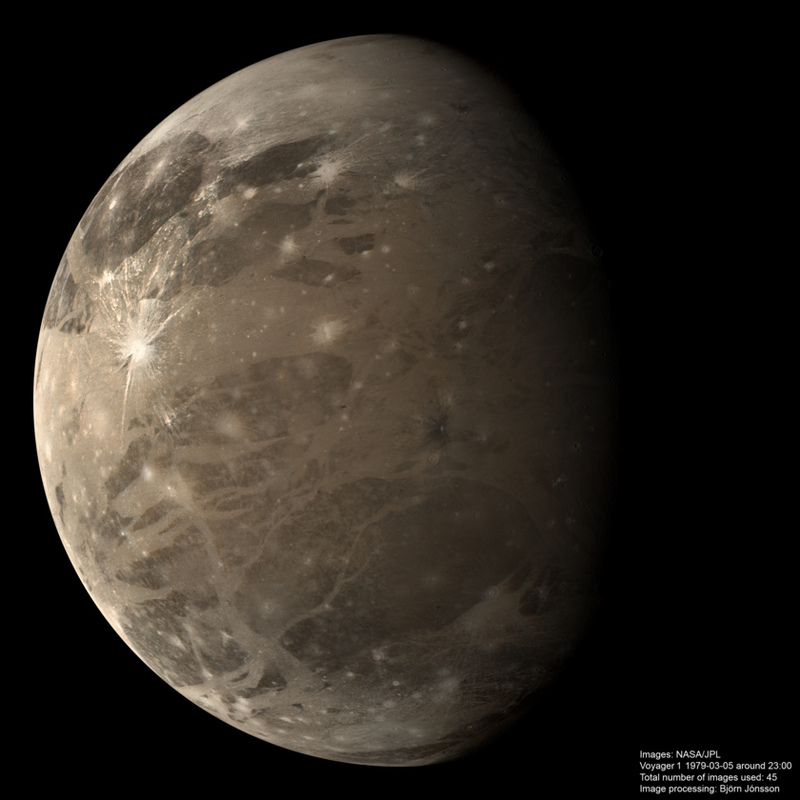 Ganymede is such a fascinating, enigmatic, alien moon. It has some characteristics of Europa mixed in with characteristics of the other moons. Thank you for sharing this with us. The quality of the images are really good. But I am wondering How many photo's were actually taken by the Voyagers..and how many need and can use some work? Also, is there any ability or ( intergrity ) in 'artificially' filling in what might be missing or not usable when it comes to the images? ..hmm..
What this shows is that it is well worth revisiting older image data and looking at them again with modern image processing techniques and software. I remember seeing the Voyager data as they came in, on TV and on the pages of Astronomy Magazine. Such were the times, no internet. For decades, I have measured other solar system bodies against Ganymede for the sheer artistry and beauty of its surface. Even now, few can compare. Thanks for the fresh look at Ganymede's gorgeous face! How did they know to get Voyager to point at Osiris crater on Ganymede? Did they discover the crater with long distance photography and then update the flyby sequence so quickly? Incredible that they could sequence a mosaic like that with early-1970's technology. davispw: I believe capturing Osiris Crater in this image was happenstance. Looking over the full Voyager 2 Ganymede data set, I've found that high-resolution imaging was broken down into multiple mosaics with slightly overlapping footprints. These mosaics simply covered different portions of Ganymede, the one posted here captures the southeastern quadrant, coincidentally where Osiris Crater happened to be at the time. Voyager's pointing was a little inaccurate, even if this crater had been intentionally targeted, it was unlikely to be so perfectly at the mosaic's center. Not trying to knock Voyager or anything, but sometimes luck was a big factor in these missions!